The Gray Hairstreak (Strymon melinus) is the most common hairstreak (Subfamily Theclinae) butterfly found here in Tucson, Arizona. Hairstreak butterflies are named for the small, slender, hair-like tails on their hindwings. 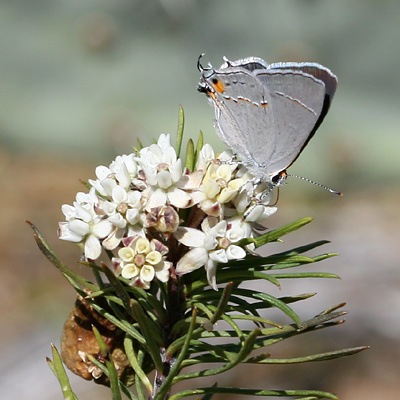 Gray Hairstreaks have a single tail on each hindwing, and near this tail is a bright orange eyespot. These eye-like spots, with their adjacent hindwing tails that look a bit like antennae, deflect the attention of predators toward the edges of the wings, which the butterfly can afford to lose, and away from the butterfly's actual head, which is definitely not expendable. 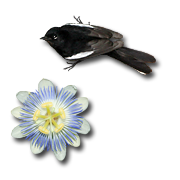 Gray Hairstreaks have dull bluish-gray dorsal wing surfaces. The ventral wing surfaces are predominantly gray with an orange, black, and white dashed line on both the forewing and hindwing. 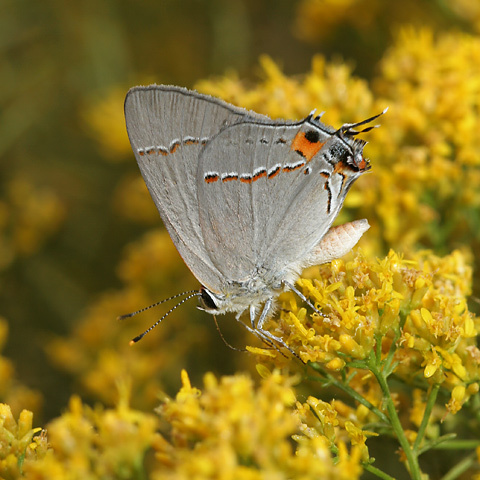 Gray Hairstreaks can be distinguished from the similar Red-lined Scrub-Hairstreak (Strymon bebrycia) by the black dashed line that intersects with the orange eyespot on the Gray Hairstreak's ventral hindwing. Gray Hairstreak caterpillars are not very choosy and will feed on a wide variety of host plants, which is one reason these butterflies are so common.